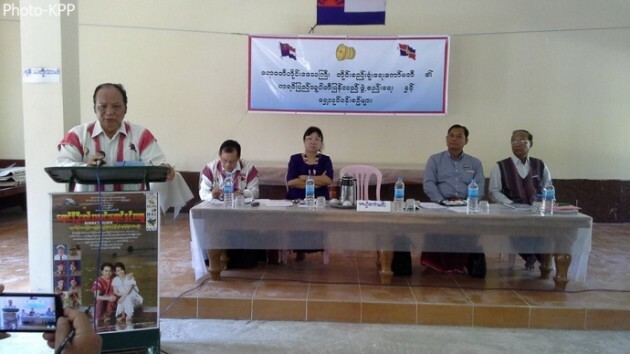 Regional level Karen People’s Party will reorganize its structure starting from the village tract and ward level. The party’s township officials discussed the issue at its meeting on March, 12 at Mahatheindawgyi Monastery in Pathein, Ayeyawaddy Division. Mahn Tun Tin, the KPP’s Ayeyarwaddy regional chairman spoke to Karen News. Mahn Tun Tin said that when it comes to forming the party organizing committee, educated young people will be included and leaders will be democratically elected by a majority vote in all village tracts. More than a 100 party officials from the townships attended and heard how the about the integration of the Karen parties would be made. The party officials were also asked to suggest a new name, flag and logo for the new integrated Karen party. The integration of Karen political parties was unanimously supported. Saw Say Wah, the party vice-chairperson, said that party members at the township level have been directed to systematic reorganized to make te party stronger in the Ayeyarwaddy region. Saw Say Wah said that the party will be reformed to become a party that the people in the Ayeyawaddy region can rely on. Saw Say Wah said that at the village level party leaders are to be elected democratically by majority votes by its member at and central level party leaders will be elected at the party conference scheduled to be held in May, 2016. Mainly based in Yangon, the Kayin People’s Party was officially formed in May, 2010 and six of its representatives won seats in the 2010 election. In the 2015 election, only one of its representative, from Thandaung Gyi Township constituency #2, won a seat in the People’s Parliament or Pyithu Hluttaw. The one win was out of more than 100 representatives contested seats.